India is a land that has been ruled by various kingdoms and dynasties. Most capitals and cities India were traditionally built inside the ramparts of a strategically located fort. While there are many forts that date back to the ancient era of the 4th century BC, most of the old forts have now either been abandoned or have become an important historical monument. The Forts in India due to their distinctive architecture are revered by tourists and attracts millions of visitors. Here are the top 5 historical forts that you must visit in India. The Massive fort is located in the national capital Delhi and is also considered as one of the revered historical monuments in India. It was built by the Mughal Emperor Shah Jahan in 1648. Red fort is considered as the prime example of Mughal Style architecture and combines the various architectural styles of Persian, Turkish and Hindu Architecture. The various apartments in the fort are connected through a centrally running canal also known as the ‘Stream of Paradise’. The massive fort is built in red sandstone and spreads across an area of 254.67 acres of land. The brilliant architecture and the various artifacts the fort houses has made it a UNESCO world heritage and also the spot where the prime minister of India hoists the National Flag every year on 15th of august which is India’s Independence Day. Situated in Jodhpur, the capital of the Rathore Rajputs of Marwar, the fort is situated 122 meters above the city on the top of a hillock known as ‘Bhaurcheeria’ or the Mountain of Birds. The fort was built in the 15th century by the Rathore Ruler Rao Jodha who decided to move the capital of Marwar from Mandore to a strategically secure location of Jodhpur. The fort is exemplary of the fine craftsmanship and architectural prowess of the Rajputs and is considered to be one of the unconquered forts in India. The various apartments and galleries often leave the visitors awestruck and mesmerized. The fort also contains a museum where several historical artifacts, paintings, handicrafts, armor, weapons and firearms are displayed. This fort is another UNESCO world heritage site in India. 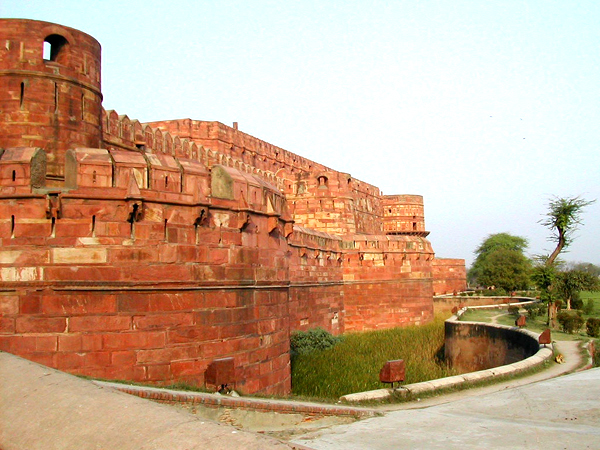 The fort is situated near the Yamuna River, the water from which was used to feed the moats around the citadel. It was originally built in the 11th century and was ruled by the Sikarwar Rajput clan. The fort as we see today was built by the Mughals as Agra was one of their capitals. The site was captured several times and was renovated on by various rulers; it was however, the Mughal Emperor Shah Jahan who is credited for the fort’s current monolithic structure. It is built in red sandstone which is a trademark of the region. The fort contains various structures which were built to commemorate the various victories of the Mughal Rulers. The architecture of the fort is unparalleled and attracts a huge number of visitors. The fort is popularly called the ‘Gibraltar of India’ and is one of the most structurally sound forts in India. 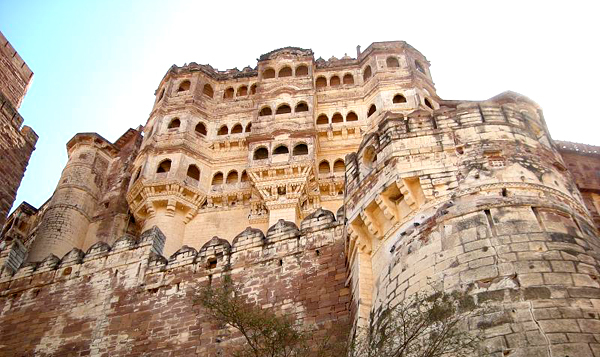 The fort was built in the 8th century by the rulers of the Tomar Dynasty and is located in Gwalior. The site currently serves as an archeological museum and houses few of the most exquisite collections of historical paintings, handicrafts and artifacts from the various clans that ruled the fort from time to time. The fort complex contains several palaces, temples and water tanks. There are also 11 temples that are dedicated to Buddha and Jain. The fort is also one of the very well maintained historical forts in India. The fort is also famous for being the last stronghold of Rani Lakshmi Bai who achieved martyrdom fighting the British occupation of India. Fort is known for being the capital of the medieval kingdom of the Qutb Shahi Dynasty and is situated in Hyderabad the state capital of Andhra and the newly christened state of Telangana. The region is also known for its mines that has produced world famous gems like the Koh-I-Noor and The Hope Diamond. 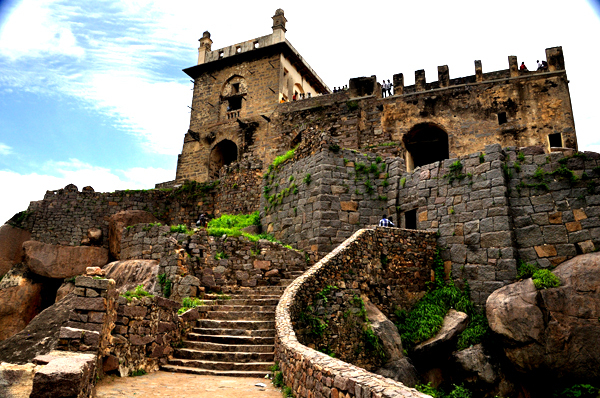 The fort is built on a granite hill that is 120 meters above the city. It was originally built by the Kakatiya between 945- 970 AD and flourished under the rule of the Qutb Shahi Dynasty. The fort complex comprises of 4 forts that are interconnected and contain various palaces, temples, halls and gateways etc. The architectural style is unique as compared to the other hill forts found in India as it has traces of Persian, Turkic and Dravidian style of architecture with the majority of structures built in Turkic style. Being a country with more than 4,000 years of ancient history, India has been blessed by various historical forts and monuments. The 5 forts mentioned above are examples of the finest architectural styles prevalent in India. A visit to these will definitely help you experience the vast history and experienence the times when the illustrious dynasties ruled the lands of India. Rohit Agarwal is an avid travel blogger and a traveler who likes to experience and discover new cultures in India. He is also a blogger at Trans India Travels, a website that provides information about the various travel destinations in India. The tourism industry of India is considered to be among the top 20 out of all the countries in the world. India is a historical country with a vast and deep rooted culture and has seen the reign of various ancient and historical dynasties and kingdoms. Each dynasty and kingdom that ruled the land brought with them a distinctive style of arts, crafts and architecture. India is a home to a huge number of cultures which are strikingly distinctive from each other. The ancient and historical architecture in India has always been popular and attracts millions of tourists from all over the world each year. 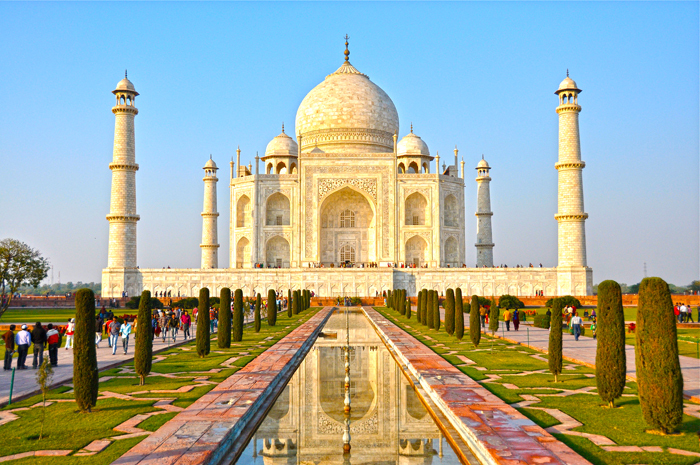 Here’s a list of the top 5, must-visit historical monuments in India. The most famous and elusive of all the monuments in India, the Taj Mahal is one of the most brilliant pieces of Mughal style architecture in the world. Located in the city of Agra, Uttar Pradesh, the building is a mausoleum which was built in the memory of the Mughal Emperor Shah Jahan’s late wife Mumtaz Mahal. It is built entirely out of carved white marble and the craftsmanship of the various decorative murals and marble carvings is totally unparalleled. The structure is also a part of the 7 wonders of the world and is a UNESCO world heritage site. The Taj Mahal has been covered in various documentaries and books, which explain the details of its design and the story of how it was constructed. Built on the banks of the river Yamuna the white as pearl structure is a symmetrical marvel and is one of the top tourist attractions the country has to offer. Apart from Taj Mahal, there are a few other tourist attractions in Agra which should not be missed on your visit. The monument was built during the British Rule in India and is located in the economic capital of India, Mumbai. The building marks the arrival of the British Majesty King George V and Queen Mary, in December 1911 in India and the reason for the name of the structure. The construction however began in 1915 and the Royal Couple only saw a cardboard model of the structure upon their arrival. 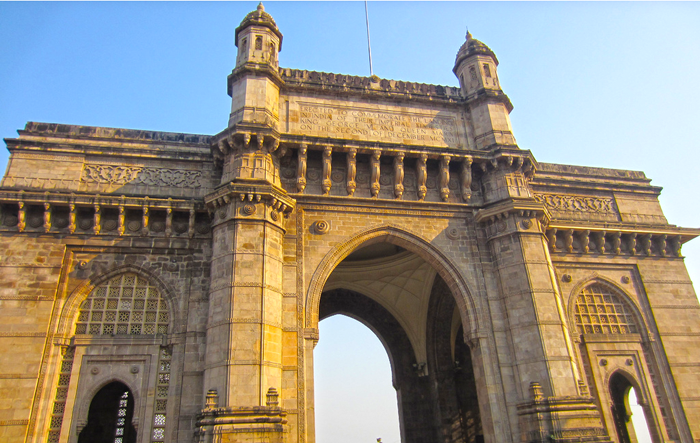 The massive gateway is located at the end of the Mumbai Harbor and was opened for public use on the 4th of December 1924 by the Earl of Reading the then viceroy of India. The architecture is a marvelous cross between the Roman arch designs and the architecture of Gujarat in the 16th century. The building is 25 meters in height and 48 feet in diameter and is build from yellow basalt and reinforced concrete. Gateway of India is surely the focal attraction of this city; but you can also checkout other places to visit in Mumbai if you want to get the true picture of this city’s history. 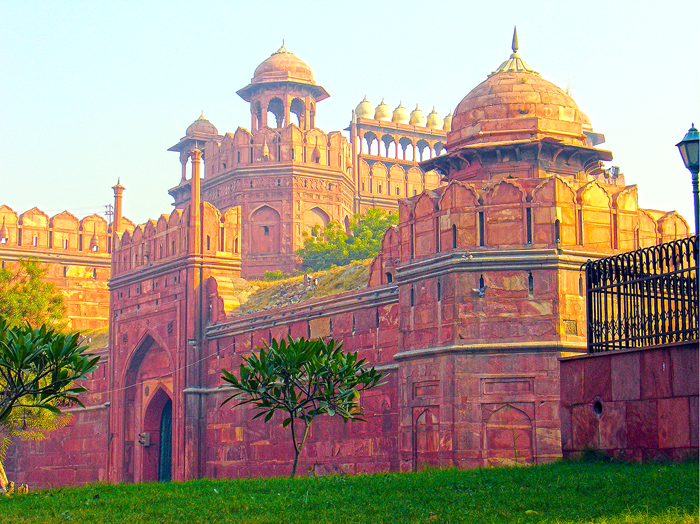 Situated in the Capital city, Delhi, the Red Fort exemplifies the pinnacle of Mughal Style Architecture in India. The Fort’s design was a template that was used in building various other forts in the country and especially in the north Indian region. The fort was built by the Mughal Ruler Shah Jahan who wanted to move his capital to a more strategic location of Delhi. 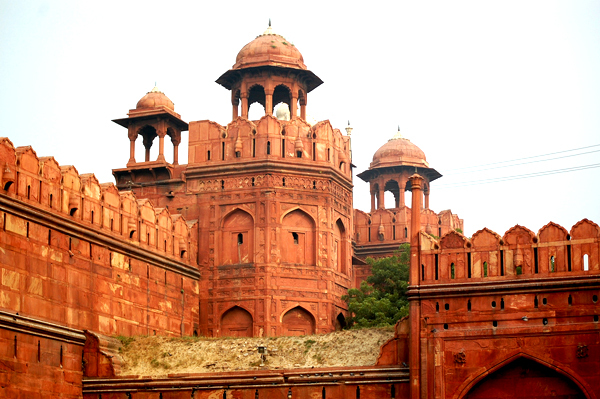 The Fort housed the Mughal Rulers for a period of 200 years and is a national symbol. The architecture is a cross between various styles of Hindu, Rajputana and Persian style of architecture and is built in Red Sandstone. Located by the river Yamuna, by which the moats around the castle were fed. Every year on the 15th of August, the Fort is used by the President of India to hoist the national flag to commemorate India’s Independence. Apart from Red Fort, there are many more historical places in Delhi. Considered to be the finest specimen of Rajputana style of Architecture, Hawa Mahal or the Palace of Winds is located in the city of Jaipur, Rajasthan. The city was the capital of the Majestic Kachwaha Rajputs and is also the capital of the state. 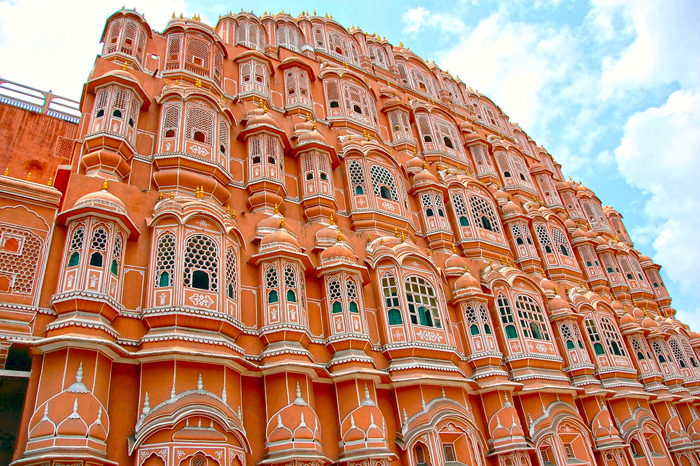 The Hawa Mahal is a part of the Royal City Palace and formed the Zanana or the Women’s chambers. The design is inspired by the crown of the Hindu deity Lord Krishna and has an astonishing 953 small windows called ‘Jharokhas’ which are decorated with the most intricate latticework. The place was intended to be the viewing spot for the ladies of the royal family where they could view the world outside. The rooms are of various colored marble stones and the scientific design provides a natural air-conditioning effect in the structure keeping it effectively cool during high temperatures. Apart from Hawa Mahal, the famous forts such as Amer Fort, Nahargarh Fort etc. are among the top tourist destinations of Jaipur for its historical importance. 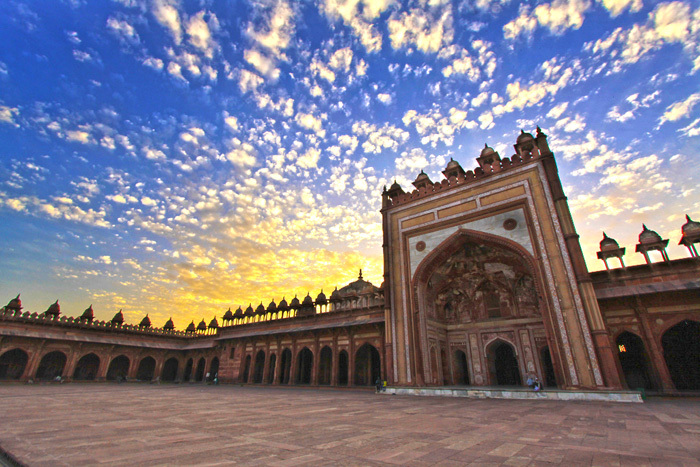 The now abandoned town of Fatehpur Sikri was once a bustling and glorious capital of the Mughal Emperor Akbar and is considered to be the best preserved collection of monuments from the Mughal Era. The entire city is a larger than life monument built by the majestic emperor and the architectural prowess is simply brilliant. The massive Buland Darwaza is the gateway that welcomes you into this wonderful work of art. The various inscriptions on the monuments exemplify the religious tolerance during Akbar’s reign and the various buildings have distinctive influences of various Indian styles of architecture. The complex contains several buildings including mosques, tombs, assembly halls, living chambers of the Royal Family and is mostly built in red sandstone and concrete. In a land where you can experience a new culture every few miles you cover, it is certainly a monolith task to make a list of the top monuments in the country. However, this is a humble attempt at compiling the best of the preserved architectural monuments in the culturally diverse land of India. Rohit Agarwal is the owner of Trans India Travels and and an Architect by profession. Rohit is on a constant search for new places and enjoys exploring the architectural marvels of India and the world. Pride and Prejudice Playgoers can enter the contest to win a copy of “Pride and Prejudice and Zombies” by Seth Grahame-Smith by sending an email to jhunkins@gmailcom . Please get parental permission first. Jane Austen remains one of the most popular writers in the history of western literature, and Pride and Prejudice is Austen’s most loved novel. From the amazing online resource Pemberley.com , the key online resource for fans of Jane Ausetn and her remarkable literary legacy, we learn that Pride and Prejudice was first published in 1813 and that the novel is the most popular of Jane Austen’s works. The original version of the novel was written in 1796-1797 under the title First Impressions, and was probably in the form of an exchange of letters. The US History of art has gone through many transitions. Indigenous Indian art is represented in many forms, from the symbolic rock art created by hunters and gatherers to Totem poles carved by several of the groups in the Pacific Northwest. Wikipedia has an excellent treatment of Native American art here. The next stage of art can be described as European religious art. This appeared with the first settlers and the influx of Christianity, representing deities, saints, and the story of Christ. Following the religious art was the influence of French impressionist painters of the 18th and 19th century. The 20th century is known for its modern art. Modern art, such as cubism and minimalism, are almost a Zen approach to art, with minimal expression yet lots of symbolism. Finally there is spiritual art. This form of art is not religious yet honors the divinity of human beings and the earth. Spiritual art demonstrates the power of the spirit and the beauty of nature. Spiritual art is just beginning to flower but it may become the next evolution of art. Each of these stages had a profound impact on the artist and the art we see around us. Each stage represents the evolution of art and human development contributing to our society as a whole. The Backus-Page House Museum of Ontario, Canada. The Backus-Page House Museum is a living history museum located within the grounds of John E. Pearce Provincial Park at 29424 Lakeview Line, south of Wallacetown, Ontario, Canada. The Georgian style house, built by Robert Morris, for Andrew and Mary Jane Backus, has been restored as closely as possible to its 1850’s state. Andrew Backus was the son of settlers, Stephen Backus and Anne Storey-Backus who came to Tyrconnell in 1810 and 1809 respectively. The land the house sits on was obtained by Andrew’s grandmother, Mary Storey, from Colonel Thomas Talbot, and when her son Walter died without children, she left it to her grandson Andrew. The property is well appointed and is home to heritage gardens, a replica bee house (the design of which dates back to the 1820s) and the St. Peter’s Anglican Church rectory horse barn which was built in 1896 and moved to the Backus-Page House Museum property in 2005. The picnic area and carriage house office with kitchen are available to rent for meetings, events, weddings, and other special occasions. The museum is maintained and run by the Tyrconnell Heritage Society which is a local independent non-profit organization. The society is funded by grants, fundraising events, and donations. Please visit our website www.backuspagehouse.ca for upcoming events and information on becoming a member or volunteer. Millions of us celebrate what at first glance would seem to be an apolitical, sentimental holiday. Mothers Day. Yet few people realize that Mother’s Day in the USA traces a key part of its history to a pacifist and feminist named Julia Ward Howe. Her “Mother’s Day Proclamation” was a strong statement about war and feminism. Julia Ward Howe was born in 1819 and died in 1910. She was most famous as the author of “The Battle Hymn of the Republic”. Howe was also prominent in the abolitionist movement, as a poet, and as an American social activist who fought for universal suffrage and women’s rights among other causes of her time. Howe met with Abraham Lincoln in 1861. However it was not Howe who brought Mothers Day into existence – that took a presidential proclamation by Woodrow Wilson after a lobbying campaign by the daughter of Ann Jarvis, Anna Jarvis, that led to an official Mothers Day in 1914. A few years after Howe’s proclamation, Anne Jarvis developed “Mothers’ Day Work Clubs” that worked to improve health conditions in the USA. It was not until some time after her death that daughter Anna succeeded in getting an official Mothers Day Proclamation. It is reported that by the 1920s Anna was already disappointed with the commercialization of Mothers Day. The US Democratic Party is the oldest political party in the United States and remains one of the oldest surviving political institutions of all time. Although the current US President Barack Obama is a democrat, the history of the democratic party is replete with personality and policy changes that in many ways have shifted the party’s focus dramatically from the early days when the US two party system was in its infancy. For example old school “Conservative Democrats” have in many states effectively been replaced by Republicans who now run on platforms not all that dissimilar to those “Southern Democrats”. A focus on Religion, small government except for defense, and low tolerance for liberal social policies like gay marriage would have been consistent with the early history of the democratic party but not the current state of affairs. From the elections of 1832 through 1856 the Democrats were dominant in the USA. This era saw the election of Presidents Andrew Jackson, Martin Van Buren, James K. Polk, and Senator Stephen Douglas. During this period both the Democratic Party and the Whig Party competed for votes and worked hard to establish large political organizations with broad based national support. For the Democrats this meant a focus on farmers, new immigrants, and urban workers. At this time the platform of the Democratic party included westward expansion, Manifest Destiny, greater equality (although this was taken to mean equality among white men – it would take more than half a century to see universal suffrage and over one hundred forty years to see the election of a president who was not a white male). A key figure in the history of the Democratic party during the years leading up to the civil war was James Buchanan. Buchanan was the last president of this important Democratic era. His administration saw the Dred Scott case, the Economic Panic of 1857, and conflicts over forts in the south. Buchanan’s successor, Abraham Lincoln, would see the attack on Fort Sumter by confederate forces, effectively beginning the United States Civil War. On a trivia note, Buchanan was the only bachelor president. Starting with the election of Abraham Lincoln in 1860 the Republican Party would dominate US national politics from 1860 to 1932. The Democrats would only see two party members elected to the presidency during that time, Presidents Grover Cleveland and Woodrow Wilson. Interestingly, William Henry Harrison was president between the two terms of Grover Cleveland, a unique situation in US political history. During this period there were major competing factions among Democrats. One was the Bourbon Democrats with Eastern business interests, another would become the “Progressive Movement” with large participation from farmers in the US South and West. Democrats controlled the US House of Representatives from 1930 to 1994. The Dems also held a majority in the US Senate for most of those years. During this time prominent Democrats were Presidents Harry S. Truman, Lyndon Johnson, and the Kennedys: Brothers John F. Kennedy, Bobby Kennedy, and Ted Kennedy. More recent democratic Presidents are: Jimmy Carter, Bill Clinton, and Barack Obama. We arrived in Paris two days ago but I haven’t blogged about it yet because I’m too lazy. Yesterday was really fun, but caused all of notre (our) feet to hurt. We went to Notre Dame and it was…huge. The biggest and most detailed church I have ever seen. It was amazing! We walked the streets for about an hour and we looked for souvenirs. My dad didn’t like that. At all. And to top it off, someone ripped him off and didn’t give him enough change! I just woke up so my writing isn’t very good, but oh well. We mustn’t dwell on the quality of the writing itself but the information that it possesses. (I totally disagree with that by the way) I’m very tired right now. We ate at McCaffee (a french McDonalds) and we ate Croissants. I love Paris!!! I could live here! This Morning we’re going to see the Eiffel Tower! That’s my favorite part of Paris. I bought a necklace yesterday with an eiffel tower charm! “Gettin on that midnight train to Oslo…Woo woo!” That is what I was singing this morning when we ever so graciously dragged ourselves out of our nice little bed and breakfast to the train station in Voss at midnight this morning/middle of the night. We got on our train to Oslo and I guess we were supposed to sleep, but that didn’t turn out well for any of us. So now, here we are, on our third train of the day and moms asleep, the brother is uploding pictures with a tired face and dad is watching me write this. I think we’re in Sweden, but who really knows for sure? … There’s really good chocolate on this train. It’s milk chocolate with rasberries or something in it….it makes me happy. I think it’s pretty cool–blogging from a train in a foreign country! That’s a first for me! Tonight (on our fourth train) we get BEDS! Halleluja! We are finally settled in to nice Bed and Breakfast in Voss, Norway! We went around town today and saw some cool stuff…like a church that was built in 1277. TWELVE SEVENTY SEVEN! That was before dinosaurs! ……just kidding. But it was a cool church…to tell you the truth, I don’t have much to say yet. Other than Norway is beautiful and today was what we call a “take it easy and don’t do a whole bunch of stuff because we’re still getting used to the time difference” day. I think I’m going to take nap now. Goodbye!